I am the parent of a severe picky eater. Anything, including smell, noise, mood, exhaustion, or environment, can make or break how my son handles a meal. Over the years, we’ve done everything from professional interventions and therapies to recommendations from friends to strategies found online to expand his sensory sensitive palate. Successes (and failures) aside, we’ve learned that methods involving force, bribes, or punishment fail. The tactics that work, or at least keep us sane and give us hope, are those that focus on encouragement, patience, and good old-fashioned optimism. 1. Prepare to fail if you fail to prepare. Years ago at Weight Watchers meeting, these eight words changed my life. It meant eating an apple before going to a party to avoid binging on cheese or packing snacks for the office to prevent indulging on cookie platters from clients. These days, it means feeding my son a light meal at home before going to a birthday party where pizza (his Kryptonite) will be served or prepping him about what to expect at a Thanksgiving party at school to ease his anxiety. 2. Cook together. My son won’t eat potatoes, but if he helps make latkes, he can interact with the starchy vegetable without pressure or fear. I can talk about different kinds of foods that are made from potatoes, and I can squeeze in a teachable moment about the tradition of cooking foods rich in oil during Hanukkah to symbolize the miracle of the Menorah. 3. Encourage through story telling. Food is about more than just eating. I love to tell my son about his dad and grandfather’s annual gravy battle at Christmas, my mom’s matzo ball soup that has been like medicine since I was a little girl, and the vanilla cake with buttercream frosting that I bake from a recipe handed down three generations from his great grandmother. 4. Pick your battles. A holiday gathering in an unfamiliar setting with new people, strange voices, loud music, and unappealing smells isn’t the time to try a new trick you read about on a blog or a suggestion that your husband’s co-worker’s wife’s sister-in-law swears by. It’s also not the time to take on a harsh “you’ll eat what’s served or you won’t eat at all” attitude. I’ve been there (believe me! ), but your child’s stress level is high enough without dealing with your anxiety, too. 5. Put your blinders on but look around first. I’ve been at a party and watched a kid fill a plate with artisanal cheese, mixed olives, shrimp with cocktail sauce, raw vegetables, and sliced medium rare filet drizzled with Bernaise sauce while my kid filled a plate with a mountain of crackers. First, look around. Pint-sized foodies are rare. Chances are there’s at least one other kid (or adult) eating crackers for dinner, too. Then, put your blinders on. Is your child complaining? Is he saying please and thank you? Is he playing nicely with other children? Focus on what he’s doing well instead of comparing him to others and obsessing over what he isn’t eating. 6. Don’t let anyone undermine you. Everyone likes to blame the parent of a picky eater. I was once at a holiday party where my son ate bread for dinner. I decided ahead of time not to feed him a separate meal. Instead, I challenged him to find a desirable food at the party and eat it without complaint. He did it, and I couldn’t have been more proud of him until another dinner guest said, “You’re letting him eat bread for dinner?” Unfortunately, I let her comment derail what I deemed a success moments earlier, which leads me to my final piece of advice. 7. Remember what the holidays are really about. My son knows how much I love cooking and eating, but he also knows that what matters most at any meal is the time we spend connecting and making memories together. What we eat or don’t eat is secondary. Every holiday season, I make it a point – for myself as much as for my son – to reinforce the value of family over food. From Thanksgiving until New Year’s Day and beyond, there will be countless meals to endure with your picky eater. Take it one carving station at a time, hold on to what truly matters, and savor every victory, no matter how big or small, and especially the ones that involve crackers. I love this post! 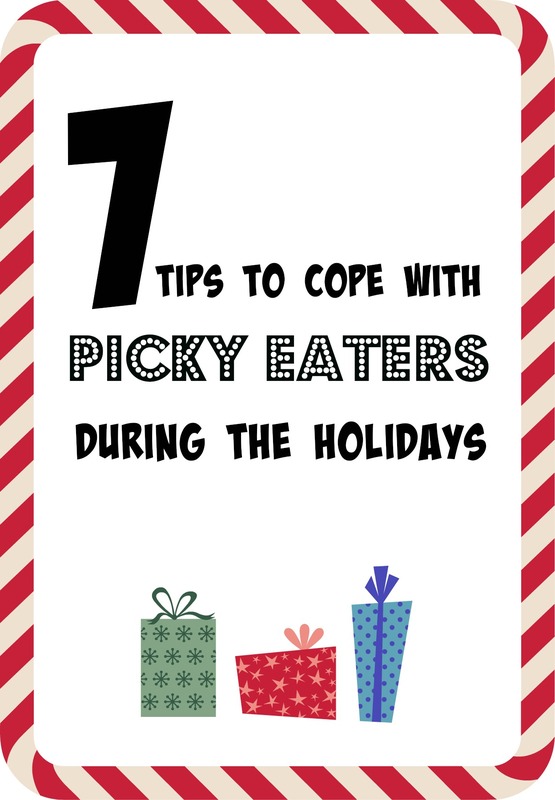 Great suggestions and as a mom of an insanely pick eater, I can vouch for each one! Well done! Nice post, I totally get what you mean when you watch (or try not to watch) other children eat at functions. Reminds me a birthday party we went to at a bowling alley when all the children were eating pizza, I was just grateful I had brought some grapes and put them on his plate ahead of time. He sat for a while and ate a couple of grapes, then he was on the floor spinning in circles. I like that you remember what’s important, family not the food. As I wrote, it’s a lot easier said than done, because we all just want our kids to eat the pizza, right? But we carry on. We bring grapes. We focus on other positives. Thanks for reading! You don’t even KNOW how timely this post is… our 6 year old will ONLY eat bread and strawberries. His protein is peanut butter – but it has to be on a open-faced sandwich – can’t have bread on top. THANK YOU THANK YOU THANK YOU! I too celebrate a dinner where he eats bread and only bread – if it means he’s at the table participating in the conversation and being kind to his brothers. I needed this today! Nice & thorough – I kept tensing up and then relaxing as you slayed one after another of my holiday woes. Family not food! The bread for dinner club! Easygoing most of the time… As you can imagine, I have more patience on some days than others! Love this post. My kid isn’t too picky of an eater but your tips can be used in so many other ways as well. Thank you! Great post! My kid isn’t to much of a picky eater but your tips can be used in so many other ways. Thank you!